We love our Sunnydaze Quick-up Canopy! As a matter of fact when camping people stop and ask us regularly where we purchased it and we proudly tell them Overstock. Not only is the quality and ease of construction wonderful (Hats off to the company! ), but also the service we received from Overstock is unmatched in today's market. We use it for shade through the day, rain cover should we need it, and a fun place to gather under a lit area with family and friends at night as it has ample place to hang multiple types of lights. This is by no means made of mediocre material, it withstood heavy winds during our last camping trip and has been taken up down more than its fair share. It has been to school functions, family reunions, spared our grand-babies from the sun while swimming, and numerous other activities. sounds silly how one inanimate object brought such joy but think about all the once in the lifetimes it provided my family, days that cannot replayed and hurry and buy yourself one. You will not be disappointed! We are more than pleased with this product and our only regret is not buying it sooner. This aluminum heavy-duty canopy set takes shade and shelter tents to the next level with its thick-legged construction engineered to withstand winds. 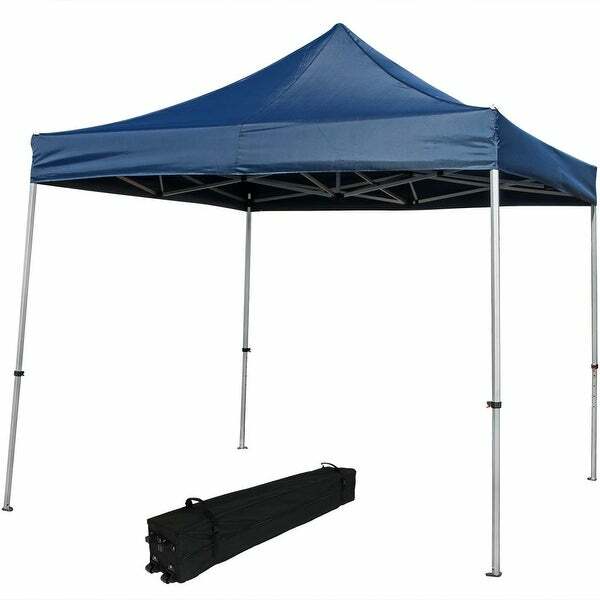 The sturdy, durable canopy sun shelter kit is the perfect choice for sporting events, picnics, parties, craft fairs, farmer's markets, festivals, food vendors, campgrounds, backyards, tailgating and more. Plus, the 100 square feet of shade is perfect for protecting you and loved ones from the harmful rays of the sun or rain showers. This canopy tent shade comes ready to set up in its own black zippered rolling bag on wheels for easy portability. The canopy features a sturdy cross-beam ceiling design with spring buttons for easily adjusting the height of the legs, and plastic push buttons for locking in the width when setting it up, and easily collapsing or securing the ceiling. The reinforced corners of the canopy top paired with the heavy-duty thick aluminum legs ensures the canopy is easy to use and will last for many seasons to come. Plus, it comes with four 1/8-inch thick steel stakes and four 10-foot ropes so you can easily secure it outdoors on the grass. Dimensions 120.0 In. X 120.0 In. X 128.0 In.